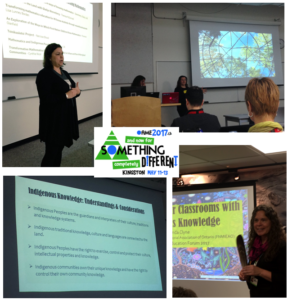 Want to know what our Indigenous Knowledge and Mathematics Education (IK) Community of Practice has been up to? We are excited to share the following updates! The IK CoP met online with TVO to discuss how they can use TeachOntario to create an online environment that will showcase their work and create a collaborative virtual working environment. Many lead members of the CoP attended and presented at this year’s OAME conference, including Jodie Williams (top right), Colinda Clyne (bottom right), and Pamela Agawa (top left), pictured below. The IK CoP also held a face-to-face meeting with their members who attended the OAME conference to get to know each other and the work they are connected to, and discuss their upcoming meeting in June 2017. To help inform their network of the work they are doing, the IK CoP submitted their work to be published in the FNMIEAO annual newsletter. Three surveys have been sent throughout the province to assess the landscape with respect to the work of the IK CoP. They are targeting School Board Math Consultants/Coordinators, Math educators K-12 in provincial system, and Math educators in First Nations Schools. This data will be shared at their June meeting and will inform their work going forward. As well, it will create a baseline for comparison at the end of the 4-year CoP. The lead organization in our IK CoP, the First Nations, Métis, and Inuit Education Association of Ontario (FNMIEAO), will be holding its Educator Conference on October 28 & 29, 2017 in London, Ontario. The theme of this year’s conference is Reconciliation through Education: Hearing the Truth. Please consider coming and sharing your work! To do so, please respond to the call for presenters and/or request a vendor table by May 30th, 2017. If you would like to attend, registration will open the first week of June. For more information on the IK CoP, see their page and subscribe to our mailing list to receive regular updates.